Speedy Tuesday is here! I thought it would be nice to zoom in on the differences between a Speedmaster Pro from 1967 and a Speedmaster Pro from the current collection. We get a lot of questions per e-mail (and Facebook) about Speedmasters and which one people should get, so our comparison might help you (or them) to make the right decision. The Speedmasters pictured above are today’s subject of Speedy Tuesday. 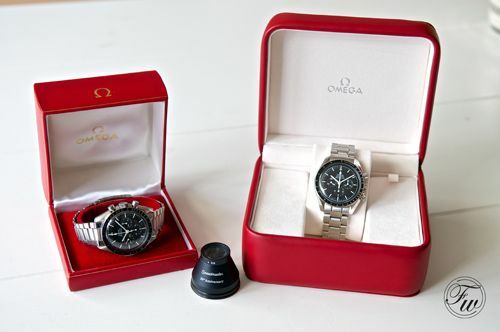 On the left you see a 1967 Speedmaster Professional ref.145.012 and on the right a 2012 Speedmaster Professional ref.3570.50, both on [time correct] stainless steel bracelets and in their original Omega boxes. I don’t want to do the whole Speedmaster rehearsal here, as we’ve covered it numerous times and the best advice would be to go to the Chronomaddox website. A very short version is: The Speedmaster was introduced in 1957 and after some adjustments in size, dial and case style the ref.105.012 and ref.145.012 were the models from the mid till the late 1960s that went to the Moon and the last versions to have the column wheel caliber 321 movement and applied logo on the dial. 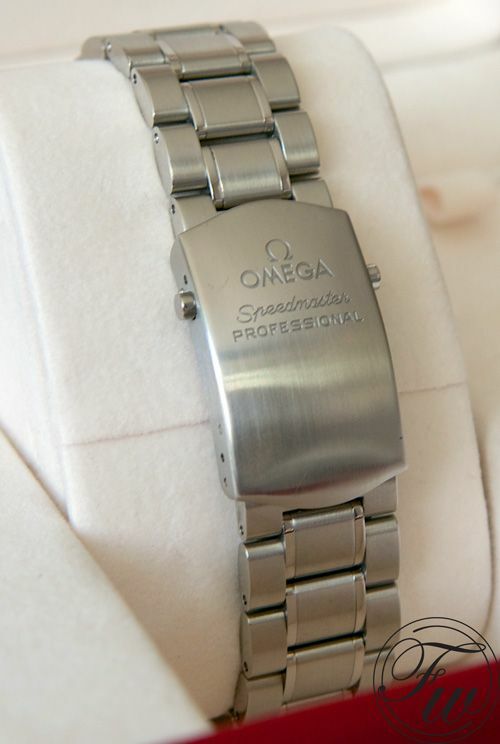 From 1968 and onwards, Omega started using the Lemania based caliber 861 (now 1861) and a printed logo on the dial. Also the hands changed a bit as you will see on the pictures. In the end, the current Speedmaster Professional with hand-wound movement is the one that comes closest to the actual ‘Moonwatch’ (105.012 / 145.012). 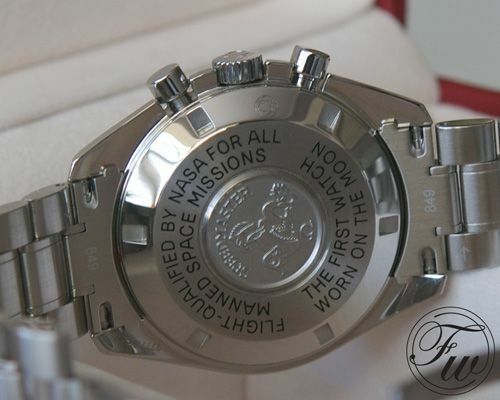 We assume that the post-1968 models with printed logo and caliber 861 movement also went to the Moon after Apollo XI. For this reason, it is the current Speedy Pro ref.3570.50 that should be considered the ‘Moonwatch’. 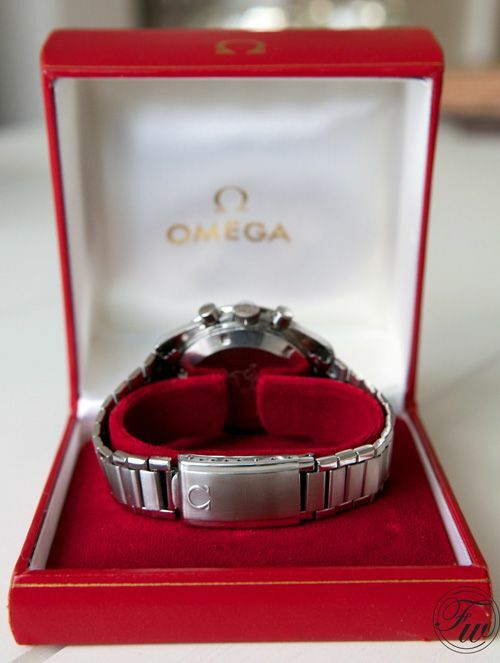 Omega also introduced watches with a larger diameter (44mm) and other movements (automatic Co-Axial calibres) and refers to them as ‘Moonwatch’ but this is not considered to be the correct label. 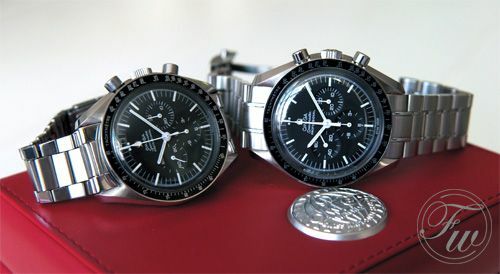 This article will zoom in at the Speedmaster Pro 145.012 and the current ‘Moonwatch’, the Speedmaster Pro 3570.50. All models prior to October 1968 have this applied Omega logo on the dials. Besides that, the typography is a bit different and the hour markers are longer than the current Speedy Pro. One of the major differences that are very easy to spot is the stepped dial on the 1967 model. The small registers are somewhat more deeply sunken into the dial and have a more visible grain. The 1967 version also has the step dial of course. As you can see, the hands are also slight different on the 145.012 reference. 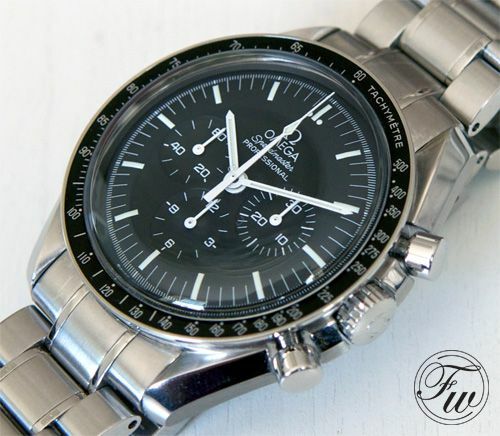 The chronograph second hand has a pointed short side of the hand, whereas the current Speedmaster Pro 3570.50 (or any other variation) has a straight short end. Of course, the tritium of the 1967 version is inactive (or just long gone) where the Super Luminova of the new Speedmaster Pro is very powerful. I would go as far that it will light up the room at night, but it is clearly readable. In essence, the cases are nearly the same. The typical a-symmetrical Speedmaster case that we’ve seen almost unchanged since 1957 till now. The very first models had straight-lugs (and so does the re-edition of that model) and this 145.012 from 1967 has a case that is nearly identical to the current Speedmaster Pro ‘Moonwatch’. One of the major differences is the lugs, the lugs on the new Speedmasters seem to be a bit longer due to lesser curves at the end. Another difference is the crown and crown guards. The new model has slightly larger crown guards and the crown is therefor a but more sunken into the case. In every-day’s use, it makes the new model a bit more difficult to wind. The casebacks are also different of course. 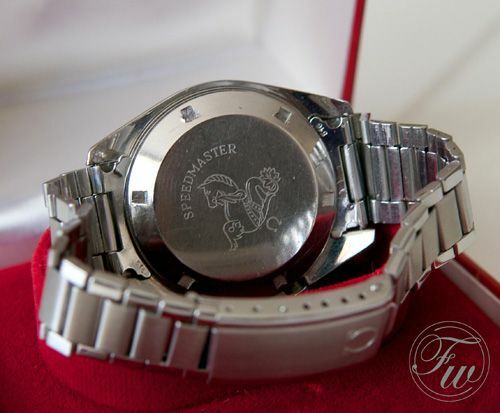 Where the Pre-Moon models have a stainless steel case back with just a Seamonster engraved and the wording ‘Speedmaster’, the case backs of the new models have the small Seamonster embossed in the center with the ‘Flight Qualified By NASA For All Manned Space Missions’ and ‘First Watch Worn On The Moon’ wording engraved around it. In the picture above you can also see (if you look carefully) a small engraving on the case back, just on the lower right of the crown. This seem to be a marking that will make it easier to spot a replica / fake Speedmaster watch as it is quite difficult to reproduce. For now. The most important reason for people to consider (or prefer) a vintage Speedmaster over a new one is the movement. Although the current Lemania based caliber 1861 movement has been a perfect and proven work horse since 1968 (small upgrade in 1997 from caliber 861 to 1861, minor tweaks though), enthusiasts seem to have a preference for its predecessor, the caliber 321 movement. Caliber 321. Photo carefully snatched from the Frank N. website. The main difference is the column wheel mechanism as opposed to the shuttle-cam system for the chronograph operation. In daily use, there is not much difference though.. the operation of the start and stop button have a slightly different (softer) feel on the caliber 321 models. 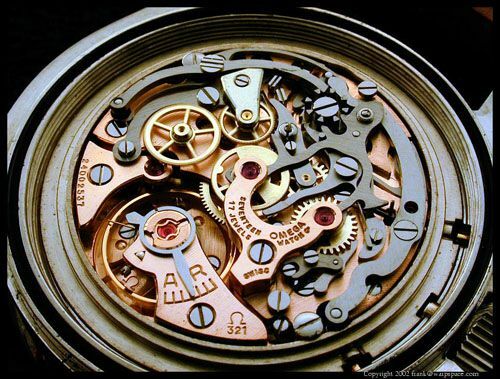 The caliber 321 movement is also ticking at a slower pace, just 18.000 bph where the caliber 1861 ticks at 21600 bph. Caliber 1861. Photo from the internet, somewhere. As you can see, the movements also have a different type of finish. The gold/copper colored finish on the caliber 321 is certainly pretty and I love the feel of the column wheel chronograph, but in the end both movements perform well. 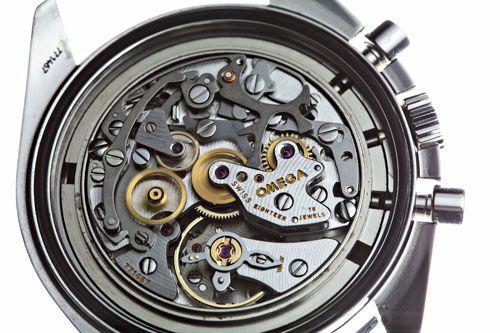 Keep in mind that the caliber 321 movement is more expensive to service at Omega, as the parts of the movement are getting more difficult to obtain (and expensive to reproduce in small quantities if necessary). In the past, I’ve written an article on bracelets together with Bas van Dorp (you can find it here) where we discussed a few different bracelets. The bracelet on the Speedmaster Pro 145.012 is the flat reference 1039 model with flexible links near the clasp. There are springs inside that make it possible to ‘flex’ when putting the bracelet on your wrist. The links are flat and folded and although I haven’t experienced it yet, it feels like it is a fragile bracelet that will easily break. Again, it didn’t happen to me or to other persons that I am aware of, but it does feel flimsy. The 1039 bracelet has satin brushed center links (and center part of the clasp) and polished outer links. A very nice contrast and fits the Speedmaster case with the same type of finish perfectly. The bracelet on the current Speedmaster Professional is something completely different. It doesn’t taper and looks more like a diver’s watch bracelet than something that comes close to the original Speedmaster bracelets. Having that said, this reference 1998 bracelet is well finished and feels a lot more solid than the vintage ref.1039 bracelet of course. It is a heavy bracelet that will definitely add a lot of weight to the whole watch, compared to the 1967 model. The bracelet still hasn’t been updated with screws (still pins that you need to ‘drive’ in or out when resizing) but they seem to stay put. The clasp has a double release button, based on a steel spring inside the clasp. Make sure to keep the bracelet clean and that this spring system doesn’t get clogged. Don’t worry, this only happens when you wear this watch daily (all day) for years and years. Just rinse it with warm water and soap once in a while. I didn’t answer this question yet and I can imagine that it is something that has been keeping you busy. With a list price of 3350 Euro (valid till October 1st, prices will increase on that date) for a new Speedmaster Professional ref.3570.50 (‘standard issue model’, hesalite crystal and stainless steel caseback) and similar prices for a vintage caliber 321 Speedmaster Professional 145.012 (or 105.012) it is a tough nut to crack. The ref. 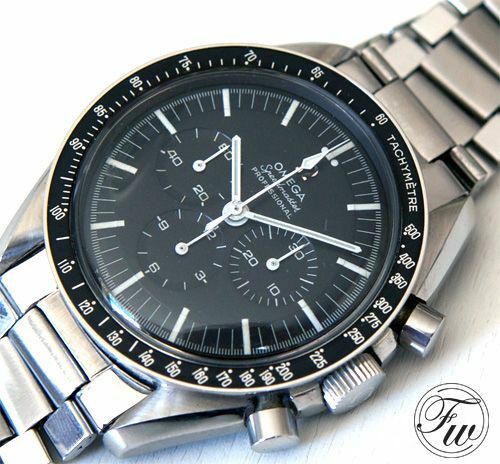 145.012 model was the first Speedmaster Pro that I bought in 1999 (1st of October) and haven’t regretted it ever since. However, if you are planning to wear the watch on a daily basis and do not want to worry about difficult and expensive service intervals and just buy it as ‘a good watch’ then I would definitely go for a new Speedmaster Professional 3570.50. With this model, every thing is fresh and you don’t need to worry about flimsy bracelets or movements that need to be serviced. 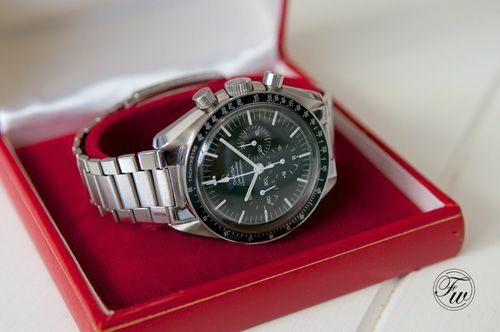 I won’t even start about the purchasing process of a vintage Speedmaster Pro, as you definitely need to be certain that everything is original and in good working order. Things are not as crazy (yet) as with vintage Rolex watches – luckily as it would definitely spoil the fun – but you do have to be cautious. I bought the 3570.50 Speedy as pictured and discussed here a few weeks ago myself (at Ace Jewelers) just to have a good new watch that I can wear on an every day basis without risking my precious vintage Speedies to get damaged.